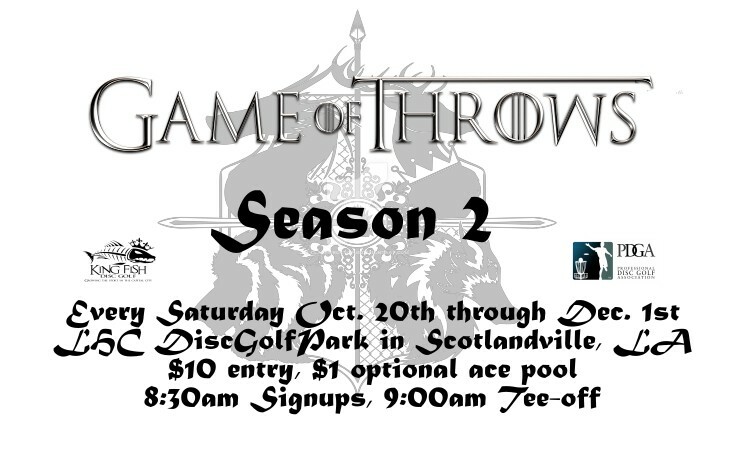 Kingfish Disc Golf presents Game of Throws Season II, coming to the LHC DiscGolfPark in Scotlandville, LA every Saturday between October 20th and December 1st, 2018. 8:30am signups, 9:00am tee-off. Who will hold the Iron Shield? This year’s GoT series will feature a team competition between four Houses –Lannister, Stark, Baratheon, and Targaryen. The Lord of each House will be determined using the top 4 scores from the first week, and these Lords will select their rosters from the remaining field of competitors - adding new players as they arrive throughout the series. Each week will feature a PDGA sanctioned singles round, and players will earn points for their House based on how many players in their division they beat. The series finale on Saturday December 1st will be a full-day event, with a PDGA sanctioned singles round in the morning and a Match Play event in the afternoon. Lunch and Games will be provided in-between rounds. Cost of entry will be $10 per week, with an optional $1 ace pool. 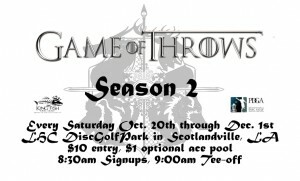 Player’s packs will include a Game of Throws T-Shirt and Personalized Game of Throws Bag Tags, and will be provided to players who Pre-Register for a GoT Five Week Pass available at DiscGolfScene.com. Half of all entry fees will go to a cash prize pool to be awarded in-full to the winning House, and will be split among its members proportionally based on the number of weeks attended by each player. The Lord of the winning House will take possession of the soon-to-be-legendary Iron Shield, and will be invited to retain their Lordship in next year’s Game of Throws in addition to being given the first roster selection. There are several overlapping events taking place throughout the series, including the Lake Claiborne Championships (Nov. 3 - 4th), Cloud 9 Presents Rumble in Ragley v. 5.0 (Nov. 10th), 2018 Legends of Lafayette Louisiana State Championships (Nov 17 – 18th), and the 20th Annual Turkey Shoot (November 24th). GoT competitors are encouraged to attend these events, and have the option of applying the results of up to 2 of these events to their GoT standings. Players choosing this option must notify the TD or their House Lord before the event and will still be required to pay the $10 entry fee for that week. Results will be calculated based on the average unofficial ratings from all rounds at that event. Kingfish Disc Go is responsible for all refunds/cancelations.